"There's something morally wrong with having a swimsuit or a dress that costs the same as a cappuccino," said Vogue International Editor Suzy Menkes when quizzed about her views on fast fashion. And many share her concerns, struggling to understand how clothing on sale at such super low prices can ever see those along the supply chain adequately compensated. But turning this quote on its head, those same concerns are now increasingly being voiced about the price of that cappuccino. In an article by Gideon Long, published recently in the Financial Times, the author highlights how coffee bean producers are endeavouring to call time on their industry’s low prices. Coffee is the daily drink of choice for many. In Europe and North America, the ‘coffee first’ culture sees many of us kick-start our day with a cup. And while some of us may baulk at the price of our favorite beverage, we rarely consider the fact that just 5 cents a time reaches the farmers who have actually grown the beans. 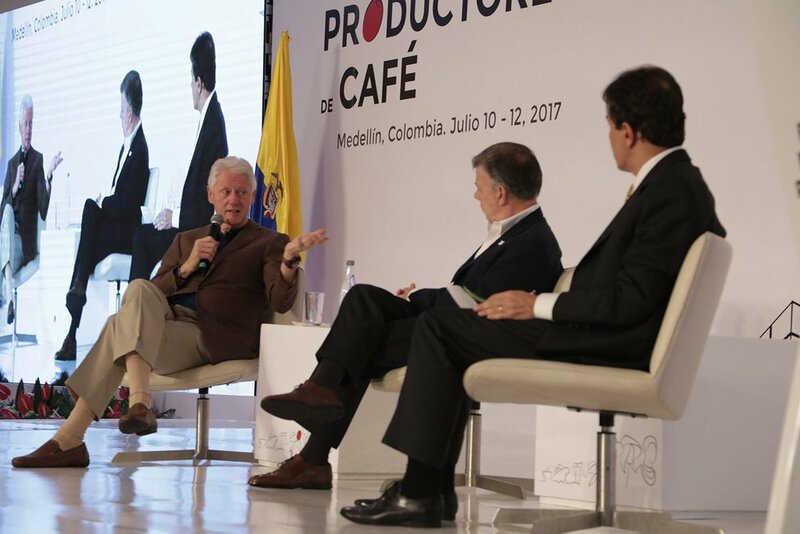 Former US President Bill Clinton joins Colombia's President Juan Manuel Santos on stage at the first World Coffee Producers Forum in Medellin. The plight of the global coffee growing industry was voiced at the World Coffee Producers Forum held in the Colombian city of Medellín in July. Speaking for many, Vincent Ssempijja, Uganda’s agriculture minister, explained that, “Our trees are old, our soil is depleted,” adding that pests and diseases were a huge threat to production. “We’re fighting climate change, our farmers are ageing because young people do not want to work in the industry any more and we have inadequate funding for research,” he went on to say. According to Long’s article, since the collapse of the quota system, world coffee market prices have fallen by two-thirds in real terms, with coffee farmers’ real earnings halving in that time. The industry may generate about $200bn a year, but only about $19bn goes to the producers, Tanzanian agriculture minister Charles Tizeba told attendees at the Medellín forum, where potential solutions put forward to try and solve what is seen as an unsustainable situation included a return to quotas, an extra 5 cents on the price of our morning cuppa and a tax on the speculative trade in coffee. Lack of compensation is just one of the challenges facing the industry’s farmers. As Uganda’s Vincent Ssempijja pointed out, climate change is also taking its toll, with producers in highland areas having to move increasingly higher up mountains to escape warming air, and those in lowlands battling against crop diseases which are both a direct result of changing conditions. CRU Kafe piloted their affordable weather stations in Nicaragua with Fairtrade International and the CLAC, the Latin American and Caribbean Network of Fair Trade Producers. And it was these concerns surrounding climate change that were among the main drivers behind the launch of CRU Kafe, one of Carmen’s Portfolio brands, a London-based company that is committed to creating an ethically sustainable coffee business. Their organic beans are grown in forested farms, which are more resilient and better equipped to handle unusual weather patterns, making them a safer investment for farmers and their futures, and their growers work hard to reinvest in the community and environment around them. Despite the plight of many of their contemporaries, Long concludes that there is hope for these long suffering producers, given that demand for coffee is rising. Speaking at the Medellín forum, Jeffrey Sachs, one of the world’s leading economists on sustainability issues, explained that, “three-quarters of the world has yet to really discover its [coffee’s] delights”, a fact that may provide some form of comfort to those who depend on the beans for their livelihood. Read more about CRU Kafe here.